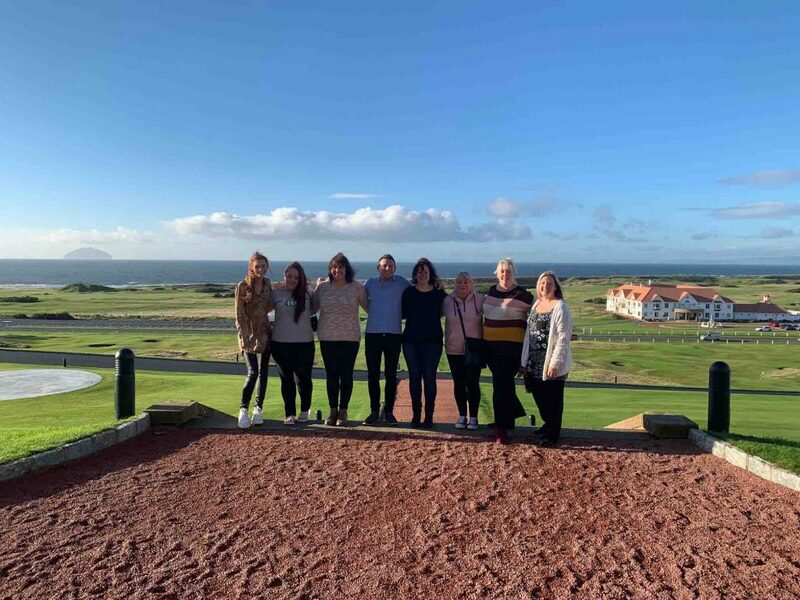 We took six travel agents on our Luxury Scotland trip to the beautiful Trump Turnberry – A Luxury Collection Resort near Glasgow with Lisa our Senior Short Break Specialist, Jennifer our Agency Sales Executive and Sarah our Marketing Manager. After a seamless flight from Stansted Airport everyone arrived at Glasgow Airport for the one hour transfer to the hotel. 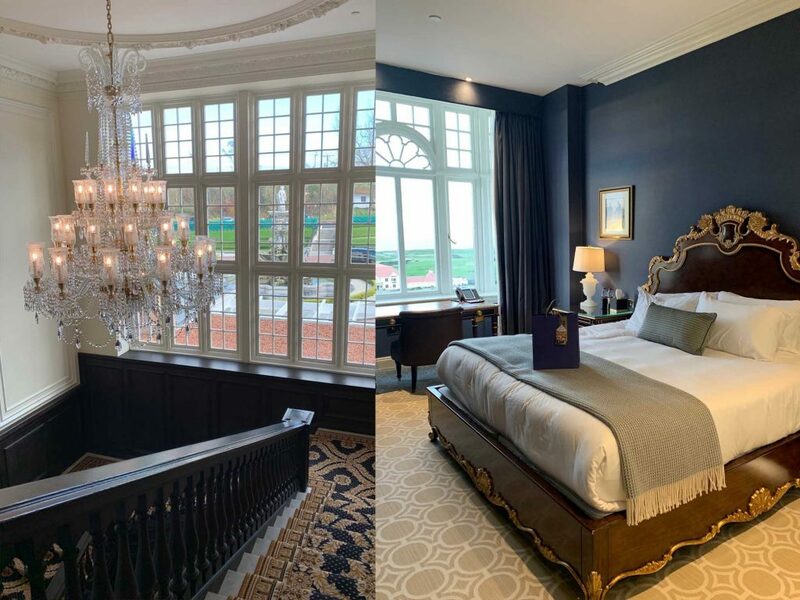 Pulling up to the very grand – Trump Turnberry, we were all fixed on this magnificent pristine white building overlooking the Irish Sea and its immaculate golf greens. Greeted by a true Scotsman in a full kilt looking very dapper to take our bags we just knew this was going to be an amazing trip! 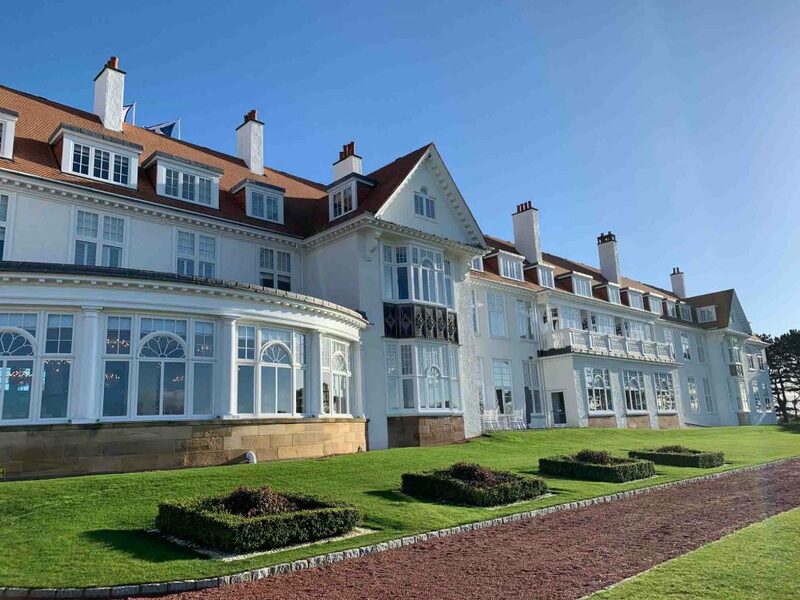 Turnberry market their hotel as one of the best luxury hotels in Scotland are they are bang on! The lobby is full of royal blues and golds with chandeliers everywhere, it really is special. – not forgetting the breath-taking views from the huge panoramic windows that line the hotel. Our rooms were just fabulous, they were huge and the bathrooms were head to toe in marble. 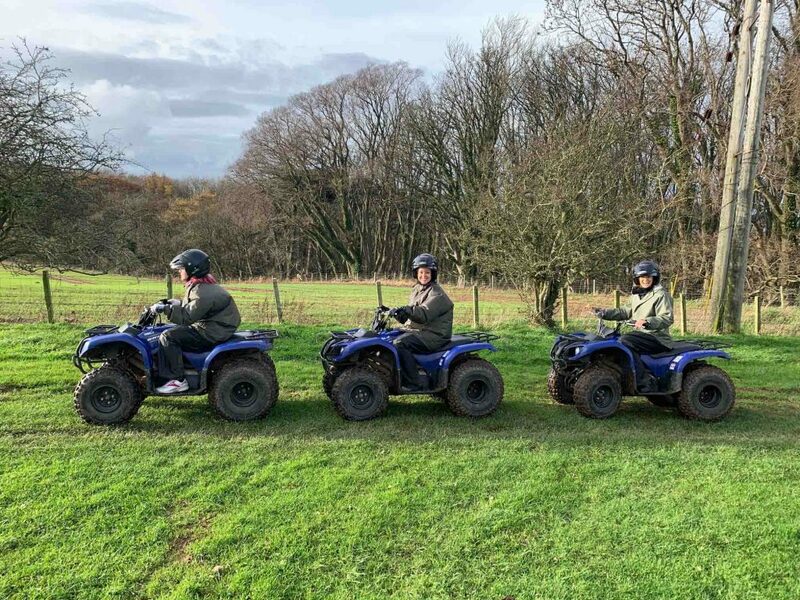 There was no time to gaze into the expensive décor as we were off for our first activity – quad biking in the Scottish countryside! What a thrilling way to enjoy the outdoors. 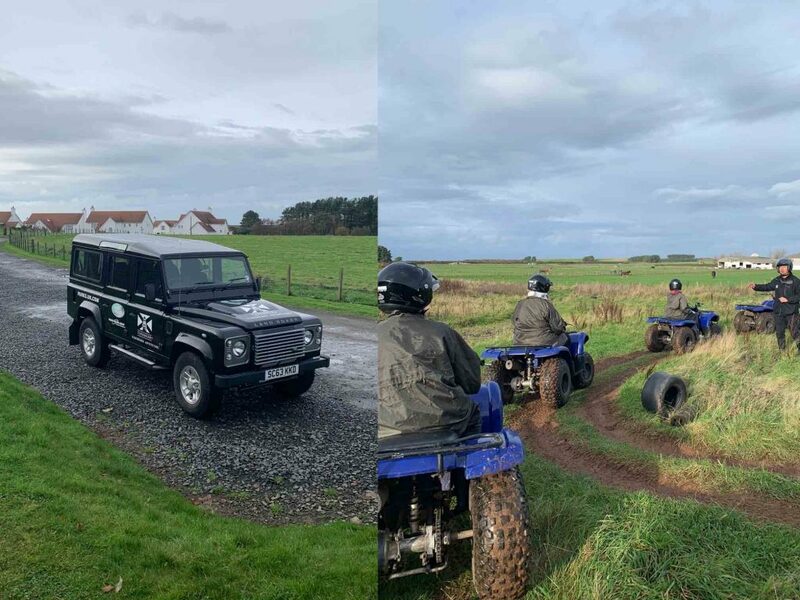 The hotel has a handful of different off-road courses that are all varying levels, some on the flat, others way up in the forest just depending on how adventurous we fancied being. We loved every minute of it as you can see from our faces! We then headed down to the ‘Duel In The Sun’ (golf clubhouse) for a spot of lunch to fuel us up for the afternoon ahead. Our next activity was Whisky tasting. 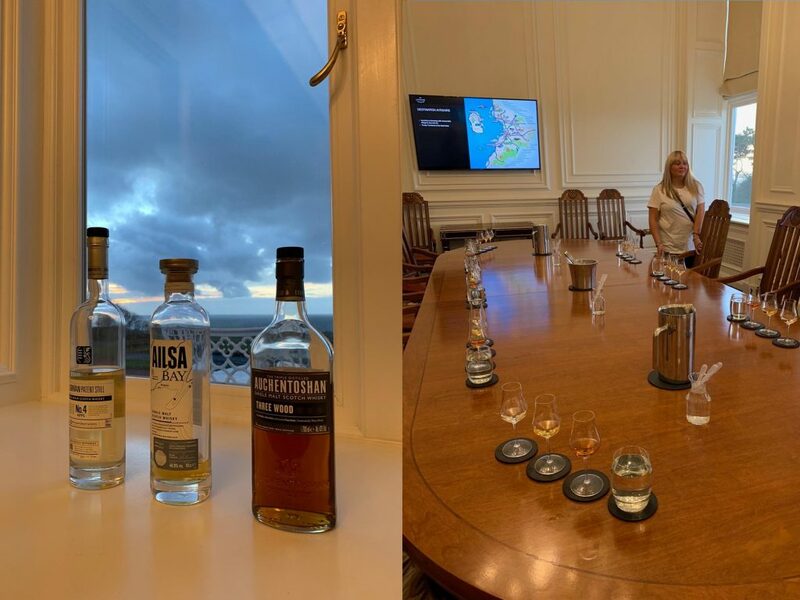 Caroline from the hotel who had been trained by a local Whisky Connoisseur gave us a full tasting afternoon with three very distinctly different local Whiskies to Turnberry. We learnt a lot with a great discussion about the tasting notes for each. Jamie from Premier Travel was in his absolute element, he just loves Whisky so was helping us all finish our drams! It was time to head to our rooms to get all glammed up for our night entertainment. 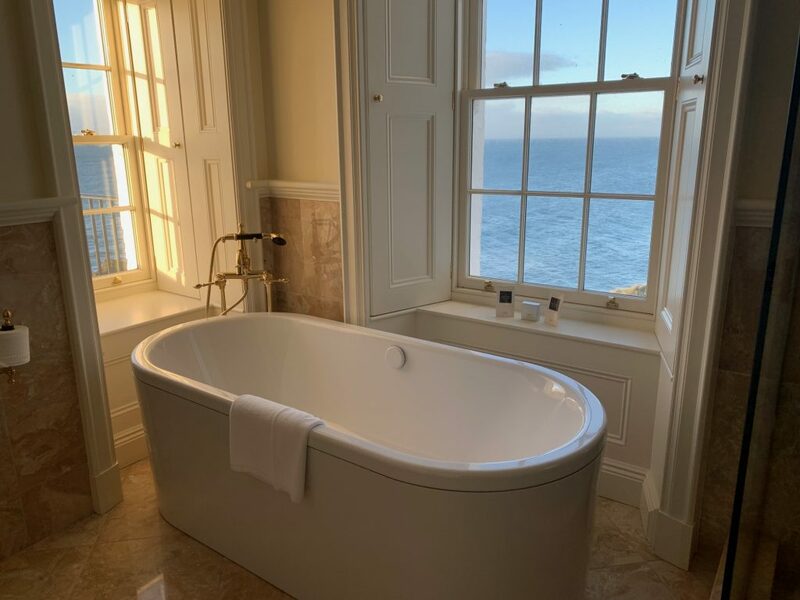 I think we all took full advantage of the huge bathtubs in our rooms so we were feeling refreshed for a great night ahead! 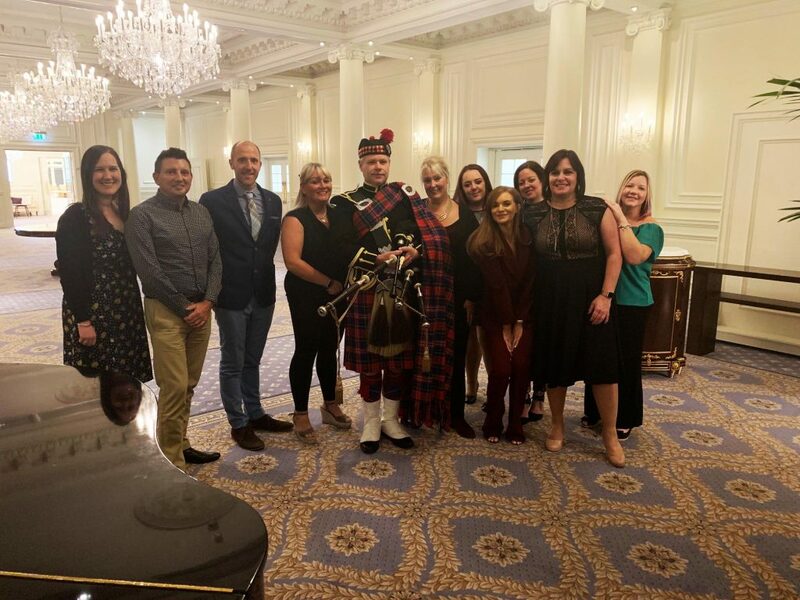 As we gathered for dinner we were joined by a traditional Scottish Bagpiper to lead us to our private dining room – wow what a magical experience! We all felt very special walking our way to dinner so elegantly behind the bagpiper, he looked fantastic. Once seated he then took us through the very Scottish ‘Address to a Haggis’ where he read out the famous Robert Burns poem and we got a little taster each too. P.S. Helen, a Haggis isn’t a real animal! Our dining room was within the 1906 Restaurant and the food was just as fantastic, from fresh local Langoustines, smoked Salmon, Chateaubriand and lamb it was just delicious! After a few more glasses of bubbly and some coffees it was time to head back to our lovely rooms for a good nights sleep. 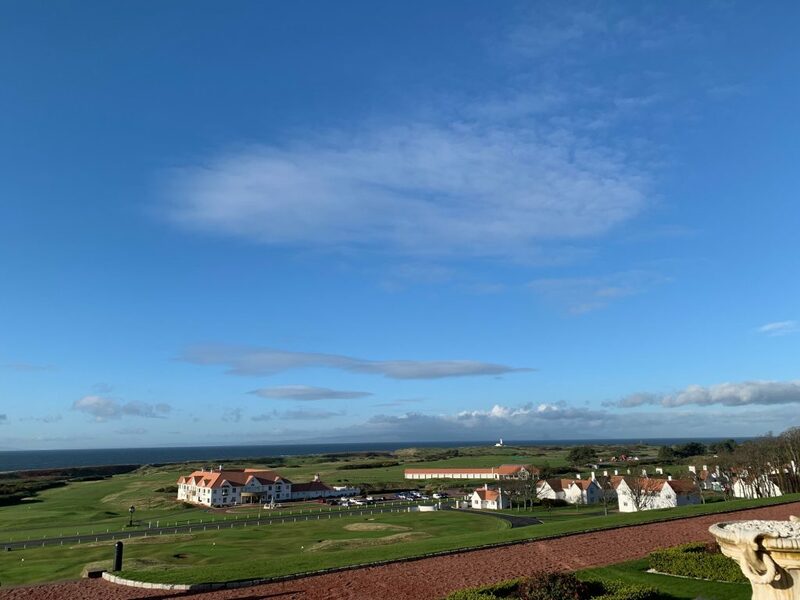 We woke to a beautiful morning in Turnberry – the sun was shining and you could see right the way to the Isle of Arran as it was such a clear day! We all met for breakfast downstairs for another beautiful spread of food: from the continental buffet to the full cooked Scottish breakfast we were in for a treat! 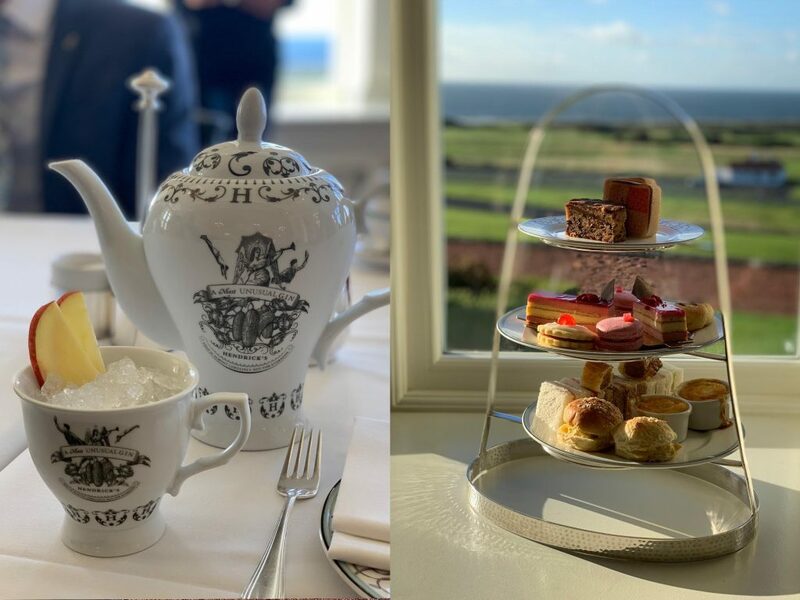 Straight after breakfast it was time for a professional golf lesson on the very exclusive Alisa course at Trump Turnberry which has been host to four Open Championships! We headed over to the Golf Academy, which was full to the brim of the most recent high-tech golf equipment you could imagine! There we were met by Stephen, our coach for the afternoon and we headed out on the green. 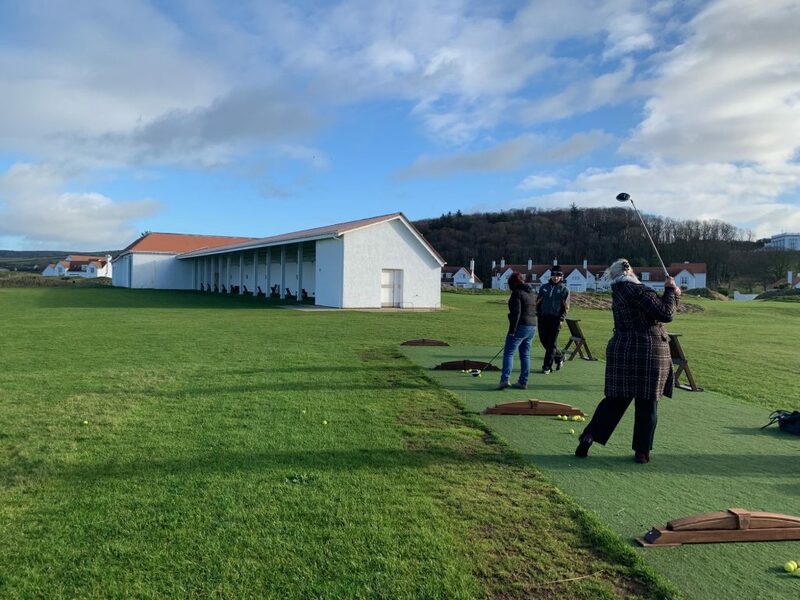 What a great little lesson we had, learning putting and driving – Nicole from Westway Travel was a natural she got a hole in one and was impressing us all! It was time to warm up after that harsh Scottish coastal weather on the golf course and we were in luck as it was spa time. We were all treated to a back, neck and shoulder massage with sometime in the pool/Jacuzzi all of which looks out onto the beautiful grounds right down to the sea. After a quick shower and check out of our rooms it was time for Afternoon Tea in The Grand Tea Lounge at the hotel. We opted for the Hendrick Gin Afternoon Tea and we were not disappointed! Gin tea cocktails, sausage rolls, mini pies, cakes, biscuits, scones and not forgetting the array of loose leaf teas we were in heaven! It was such a beautiful day the views we had were just the perfect backdrop. 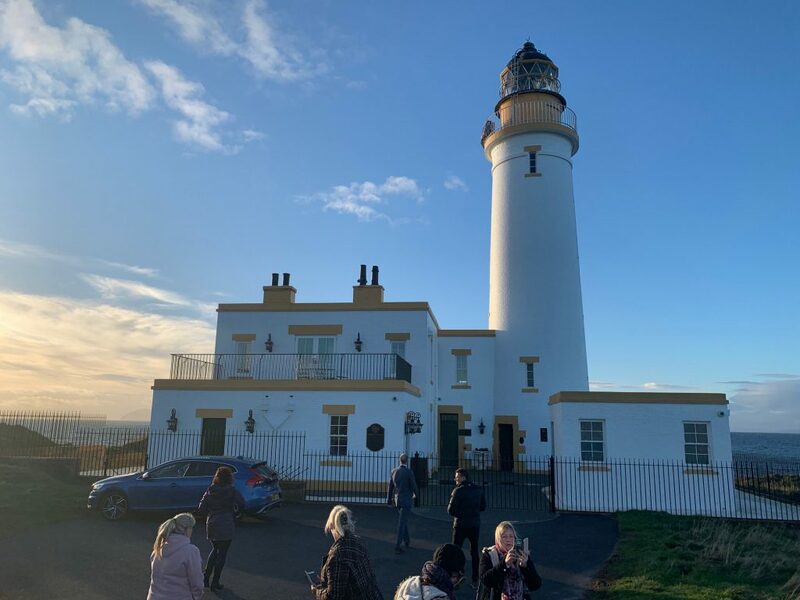 It was such a beautiful afternoon just as the sun was setting and the only thing we hadn’t seen yet at Turnberry was their fully working Lighthouse that is situated on the golf course so we headed down to the coast. The Lighthouse contains a stunning two bedrooms suite and on the bottom floor is the Ailsa course’s half way house! Before we knew it, our airport transfer was here and it was time to head back to Glasgow Airport, but what a wonderful stay we’ve had – Scottish luxury in every aspect! 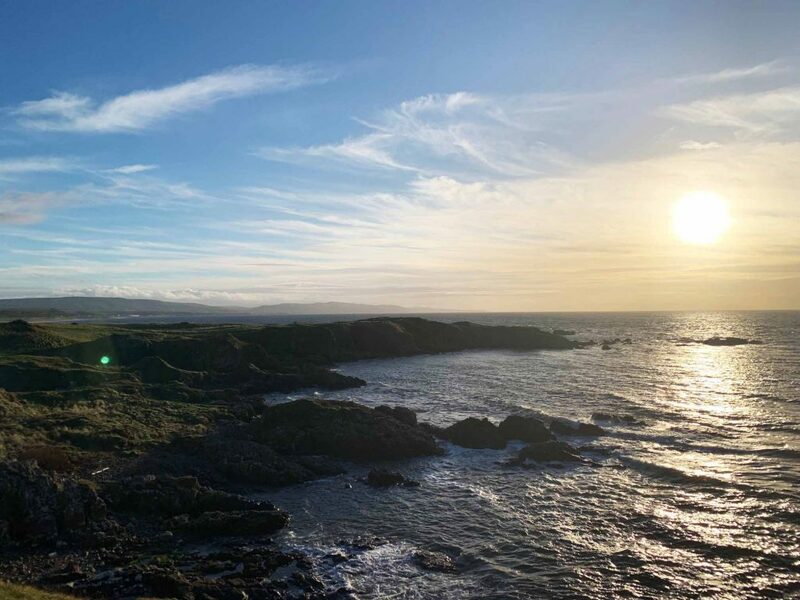 Trump Turnberry when can we come back…? A massive thank you to all of our agents that joined us on the trip and Simone at Trump Turnberry for having us. We loved every minute! To find out more about a short break to Scotland give the team a call on 0131 243 8098 or send us an email.